"Install-SPRSService : The term 'Install-SPRSService' is not recognized as the name of a cmdlet, function, script file, or operable program. Check the spelling of the name, or if a path was included, verify that the path is correct and try again"
You should install the Reporting Services SharePoint Add-In (Found on your SQL Server 2012 installation media) on every server running SharePoint. Please don't use the rsSharePoint.msi provided on Microsoft's website. "When we try to create a SQL Server Reporting Services Service Application under 'Manage Service Applications', we receive an error relating to permissions to a registry key"
There's nothing wrong with your registry except that SharePoint is looking for files that don't exist. This is because you most likely installed the Reporting Services SharePoint Add-In with the rsSharePoint.msi file that Microsoft provides on their website. That file is a cut-down version of what gets installed when you install the Add-In from the SQL Server 2012 installation media. Uninstall it from Control Panel, and re-install it with the SQL Server 2012 installation media. "we have created my SQL Server Reporting Services Service Application, but when we try to access any of the links inside it (system settings for instance), we are receiving a 503 unauthorised error message"
Windows & ASP.NET 4.5.2 Shared Hosting refers to the type of hosting where there is server which hosts many different website that is a website does not individually have a dedicated server for its own purpose. Shared Web hosting is a type of web hosting that allows many websites on the same server. The different websites owned by different people that are present on this sever share the same IP address, the same connectivity, the same CPU time. Simplicity and Cost-efficiency are the two main benefits. Sharing server space can be fairly cheap. The free add-ons, such as templates and website builders, also save the webmaster money. The host manages the resources and maintains the server, which makes things a lot easier on the site owners. For the technically challenged, this is the best solution, since no knowledge of programming, designing, or hosting is required. HostForLIFE.eu offers five types of ASP.NET 4.5.2 shared hosting plans start from €1.29 per month. With all of the shared hosting plans you can host unlimited amount of domains. Its HostForLIFE.eu LITE Shared Hosting Plan starts at €1.29 /month, and include features like 1000MB Disk Space, 10GB Monthly Bandwidth, the latest stable technologies like Windows Server 2012, Internet Information Services 8.0 / 8.5, SQL 2014, SQL 2012, SQL 2008 R2, SQL 2008, ASP.NET 4.5, ASP.NET 4.5.2, ASP.NET MVC 5.2, Silverlight 5 and 100+ Free WebMatrix and PHP Applications. Cloud Hosting systems are becoming more and more popular, because web hosts, basically Shared Hosting providers have to deal with a large amount of websites which require growing amount of resources. Cloud hosting can be useful for many companies for many reasons. Hosting in the cloud different technologies can be used together that can't be used together with regular hosting. For instance, with cloud hosting it is possible to use PHP and ASP files together and even in the same folder because it can draw the technologies needed from the cloud. This gives you better flexibility and the ability to use almost any type of technology you want to and know that it will mesh without a hitch. HostForLIFE.eu is another hosting provider that has been known for offering fast and reliable servers. HostForLIFE.eu lowest-priced ASP.NET Cloud Hosting called Bronze Plan has 1 GB Diskspace, 10 GB Bandwith, Guaranteed Conn 10Gb/s and Dedicated App Pool priced at €1.49 per month. HostForLIFE.eu provides 24/7 customers support through its Helpdesk and Email support. Our Microsoft certificated technicians offer the most professional support to help our customers on ASP.NET issues effectively. Besides, customers can check our knowledgebase to diagnose issues by themselves. Reseller hosting is the web hosting program or service which re bundles the services that are available from the primary providers or the real web hosts. The reseller can sell space and bandwidth from a rented dedicated server. Alternatively, the reseller can get permission to sell space and bandwidth from shared server. This type of hosting is the most inexpensive method by which websites can be hosted on the internet. Reseller hosting is the perfect solution for webmasters, designers, developers, internet consultants or anyone wanting to start a profitable online business. If you're looking to get into the reseller hosting business, Plesk Panel reseller hosting is the best option. Reseller web hosting is an ideal solution for those who already have a web site but maximum reliability, performance and uptime is critical to their business or e-commerce web site. A webmaster may require a network of websites under different domain names to serve different business plans, but all are hosted under a common reseller hosting account. Why Choose us to be Your ASP.NET Reseller Hosting Partner? HostForLIFE.eu Windows ASP.NET 4.5.2 Reseller Plans starts from €15.00/month allow our customer to re-brand our control panel, thus, we remain completely anonymous. We also offer private nameserver and this service is available upon request. With no contracts, the ability to cancel anytime, and a 30 day money back guarantee, our unlimited reseller hosting is completely risk free. Some of the highlighting or standout features of HostForLIFE.eu’s Reseller Plan are 10 domains, 40GB Diskspace , 200 GB Bandwith 4GB RAM or higher, DAILY Server Monitoring and support the latest technology from Microsoft such as ASP.NET 4.5.2 Hosting, ASP.NET 5.2, SQL Server 2012/2014, Windows Server 2008/2012. HostForLIFE also provide free application download softwares like Joomla 3.3, WordPress 3.9, DotNetNuke, WebMatrix Application, Mambo, Joomla, phpBB, BlogEngine.NET,etc. 1. First, Log in to your database server with a user who has sufficient privileges. 2. Create a database on your SQL Server , you can name it for example: BugNetDatabase. 3. Create a new login. I used the same name for the database and the login. 4. I disabled Enforce password expiration since this is my local server on the intranet. You can also set Windows authentication. Set the membership on the BugNetDatabase. 5. Now that you have database user/connection, you can deploy the package on web server. The instructions on codeplex site are clear. I let myself to copy these instructions here to comment them or to show how I modified. All the information in bold, blue is copied from codeplex site. 6. Download the latest stable release of BugNET, using the INSTALL package. hen you must Copy the contents of the extracted BugNET INSTALL package to the c:\inetpub\wwwroot\bugnet\ folder. In the zip folder you downloaded, you'll find 2 folders.Go to the properties of the c:\inetpub\wwwroot\bugnet\ folder, click on the Security tab, be sure to add the permissions for the appropriate user (WinXP/2000 uses the local ASPNET account, Win2003/Vista/2008/7 use the local Network Service account). Give this account modify permissions on the folder. - App_Data : This folder is where BugNET stores its database.- web.config - the application installer will create a unique machine key for password encryption during the installation process. 8. Open up the the web server IIS Console. 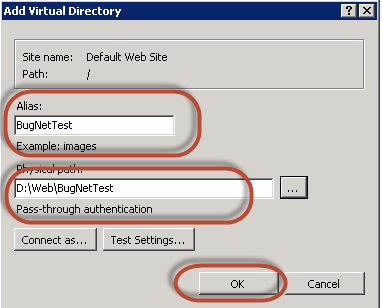 - Click start button -> then, type run -> type INETMGR then ENTER.Create a virtual directory in IIS for the bugnet folder. Right click on the BugNET folder under the default website, click on Convert to Application, if you don't have that option, choose properties and then add the application. Browse again to http://localhost/BugNetTest/. As indicated on the codeplex site for the first connection use admin/password.